Jamgon Kongtrul Lodrö Thaye was born into a Bönpo family in 1813, near Pema Lhatse in Kham, east Tibet. After his father was killed in a local battle, his mother married a lay Bön practitioner, who transmitted the Bön teachings and rituals to his step-son. He was an extraordinary child who, at the age of just two learned the Tibetan alphabet simply by seeing it once, and who, upon encountering a White Manjushri text, immediately learned it by heart. As a young age he already had great faith in Guru Rinpoche, and told his family and playmates that he was his emanation. He received further Bön instruction from Yungdrung Phüntsok from the nearby hermitage and by the time he was eight, Jamgon Kongtrul knew all the Bönpo deities, rituals, and religious dances. By his teens he was already identifying herbs and minerals. Despite all this he yearned to find a Lama who could give him instructions on the mind. When he was fourteen he was encouraged by his mother to take ordination, after his stepfather and kinsmen were imprisoned for an alleged attempt on the life of a government official. It wasn’t long before the young Kongtrul’s intelligence began to get him noticed. After being ordered to become the secretary of a local official, a lama from Shechen Monastery suggested that he study with Gyurme Thutob Namgyal at Shechen, which Jamgon Kongtrul did. By the time he was eighteen, Jamgon Kongtrul had received many transmissions and instructions from the lamas at Shechen, and at nineteen he received full ordination from Thutob Namgyal. When he was twenty, Jamgon Kongtrul was appointed secretary to Wongen Tulku (brother of the Ninth Tai Situpa) at Palpung Monastery, the seat of the Kagyu lineage in East Tibet. At Palpung he met Pema Nyinje, the Ninth Tai Situpa who became his main Lama, and took the full ordination vows a second time. He was given the name Karma Ngawang Yönten Gyamtso Trinley Kunkhyab Pel Zangpo. To prevent the obviously brilliant Kongtrul from being requisitioned by officials from Dege, Palpung pronounced that he was a tulku. His predecessor was said to be Bamteng Tulku from the region of Kongpo, thus giving rise to the name Kongtrul, the ‘Tulku from Kong’. However, he never used this name when signing his compositions. Jamgon Kongtrul studied throughout his life with many different Lamas from a range of traditions. In fact it could be said that despite his erudition and realisation, he never stopped learning. His vast accumulation of knowledge and profound understanding would have far reaching effects for the future of Tibetan Buddhism. Amongst Jamgon Kongtrul’s Lamas were Yungdrung Phüntsok, Gyurme Thutob Namgyal (his first Lama at Shechen Monastery), Pema Nyinje Wangpo (the Ninth Tai Situpa), Jamyang Khyentse Wangpo, Thegchok Dorje (the Fourteenth Karmapa), Tertön Chokgyur Lingpa and Jigme Mingyur Wangyal (the Ninth Head of the Drukpa Kagyu). Having had to curtail his first three-year retreat in order to tutor the Fourteenth Karmapa in the Sanskrit language, Kongtrul (who was now around twenty-nine) gained permission from Tai Situpa to return to retreat. Accordingly he entered a three-year retreat at the hermitage he had built for himself on the mountain side above Palpung, called Tsadra Rinchen Drak. During his thirty-seventh year he was besieged by obstacles and illness. Kongtrul had immense faith in Guru Rinpoche, and he felt it was through Guru Rinpoche’s blessing that, during an intense period of retreat, the obstacles were cleared. At the age of forty, he met the great Tertön Chokgyur Lingpa. Kongtrul had immense faith in the tertön, and saw him as Guru Rinpoche in person, and in turn, Chokgyur Lingpa recognised Kongtrul as a tertön and gave him the name Chime Tennyi Yungdrung Lingpa. Along with his Lama, Situ Pema Nyinje, the masters with whom Kongtrul had the closest relationship were Chokgyur Lingpa and Jamyang Khyentse Wangpo. Kongtrul, Khyentse and Chokling were all three considered to be reincarnations and emanations of a number of realised beings, and they all appear in the termas and prophecies of Padmasambhava. Jamgon Kongtrul was seen to be a reincarnation of the translator Vairotsana who, with Padmasambhava and Vimalamitra, first introduced and translated the Vajrayana and particularly the Dzogchen teachings in Tibet. Kongtrul was even prophesised by Buddha Shakyamuni in the Samadhiraja Sutra. 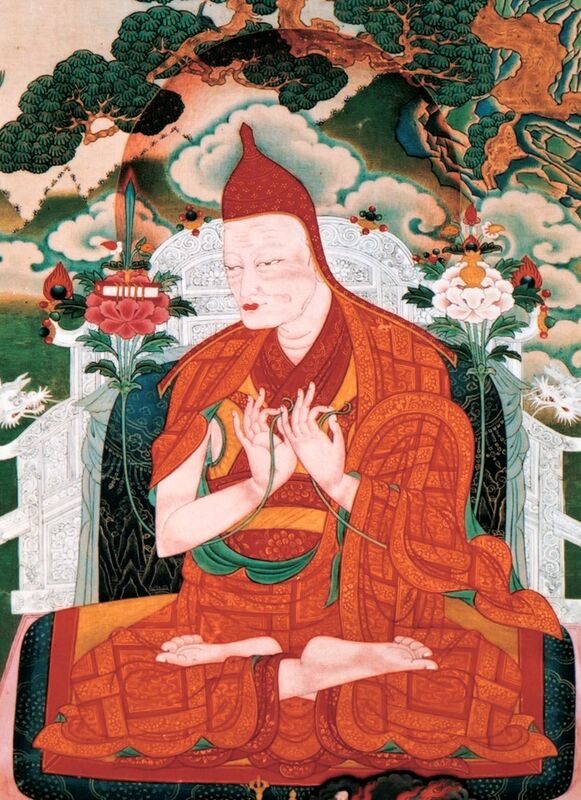 Jamyang Khyentse Wangpo, one of the greatest masters of the nineteenth century, regarded Kongtrul as the reincarnation of Ananda, Aryadeva, Khyungpo Naljor, Taranatha, and others. After Situ Pema Nyinje passed away in 1853, Jamgon Kongtrul turned to Jamyang Khyentse Wangpo for advice on most matters. Jamyang Khyentse Wangpo became Kongtrul’s Lama, inspiration and friend, and along with Chokgyur Lingpa, they transmitted teachings to each other in their efforts to revive and preserve the Dharma in Tibet. These extraordinary masters played a vitally important role in the nineteenth century renaissance in eastern Tibet. They were acutely aware of the very real danger that, due to widespread sectarian adherence to particular teachings and views by various schools and traditions, many instruction lineages would disappear. They went to great lengths to collect, compose, and teach a wide range of instruction lineages that encompassed every aspect of Buddhist teaching, without sectarian bias. This came to be known as the Rimé, or ‘non-sectarian’ movement. It is said that these masters also had foreknowledge of what would befall Tibet in the mid-twentieth century. It is therefore largely through their efforts to preserve, revitalise, and propagate the instruction and practice lineages that many of them remain unbroken today. Kongtrul had great trust in the terma tradition and, in his early forties he decided to compile the old and new treasure teachings. He sought the advice of Khyentse Wangpo, who suggested he use four texts that he himself had written (by collecting scattered terma teachings) as a basis, and then to compose a complete work on the terma tradition and Dzogchen. Uncertain as to whether it would be acceptable for him to create such a work, Kongtrul also sought permission from Guru Rinpoche himself (via the Tertön Chokgyur Lingpa), who replied, “Yes, you should definitely do this!” At this time Kongtrul was engaged in a series of retreats, during which he had auspicious dreams of precious pills belonging to the Dzogchen masters Vimalamitra and Yeshe Tsogyal. He also dreamed of reading a scripture of exceptional teachings written in silver, while seated on a throne. In another dream he saw the rising of the sun and moon and received a blessing from a special vase that Chokgyur Lingpa had discovered. He understood all these signs to mean that he had been empowered to begin his work. And so he set about composing the vast treatise that, in its entirety, came to be known as The Five Great Treasures, one of which is the Treasury of Precious Termas (Rinchen Terdzöd). After each section of the work was completed, Kongtrul began to bestow the empowerments and transmissions contained therein, to incarnate lamas and meditators. At the age of sixty-one, Kongtrul became the target of a baseless dispute at Palpung Monastery. Despite the allegations being found to be false, it would be another fourteen years before he would again enter Palpung. One of Kongtrul’s main disciples was Khachap Dorje, the Fifteenth Karmapa. Kongtrul transmitted the entire lineage empowerments and instructions, as well as his own vast collections of teachings, to the Karmapa. During the Karmapa’s last visit to Kongtrul at his hermitage at Tsadra Rinchen Drak, both had the feeling that, despite making many prayers to the contrary, they would not meet again in that lifetime. With this in mind, the Karmapa made the request that, should circumstances prevent their reunion, Kongtrul would take rebirth in his family. Kongtrul accepted this request (he would take rebirth as the Karmapa’s own son, Palden Khyentse Öser, the Second Kongtrul). Soon after, a year before the dawn of the twentieth century, Jamgon Kongtrul passed away the age of eighty-six. In fulfilment with his own prediction, Kongtrul had outlived both Khyentse Wangpo and Chokgyur Lingpa. According to a terma prophecy by Padmasambhava, all three of these masters were destined to pass away in a rainbow body. However, it is said that because of their vast activity to benefit beings and the huge numbers of students they’d had, this was not possible. Jamgon Kongtrul had many students and disciples. Among these were: The Fifteenth Karmapa, Lobzang Chöjor Lhündrup, Mipham Gyamtso, Loter Wangpo, Ngawang Damchö Gyamtso, Sakya Shri, Thubten Chökyi Dorje, Chökyi Gyamtso, Ngawang Legpa, Tashi Öser, Sönam Chödrub, Kunzang Namgyal, Thubten Gyaltsen Öser, Sherab Chökyi Nangwa, Donag Tendzin, Rigdzin Gargyi Wangchuk, Norbu Tendzin, Orgyen Tendzin, Karma Nedön Nyingpo, Kunga Nedön Zabpa, Mipham Chökyi Jampa, Ngawang Chöpel, Zongbo Kyabgon, Karma Chökyi Nyinje, Thubten Legshe Zangpo, and Tashi Chöpel. It is said of Jamgon Kongtrul that his activity was so prolific that if you look at all the practice he did in retreat, it appears that he spent his whole life in retreat. But then, if you look at how much work he authored or collected, it seems he must have spent his whole life writing. However, from the amount of time he spent teaching and giving empowerments and transmissions, he must have dedicated his life entirely to that!